You’ve seen them before. You’ve heard their electronic, rythmic beats. They’re the dudes who wear the cool robot helmets who seem like they’ve been relatively famous for our entire lives. Well, they kind of have been famous for as long as most of us (millennials) have lived. The French robo-duo, Guy-Manuel de Homem-Christo and Thomas Bangalter, beginning in 1993, make up Daft Punk. They are two-thirds of an old French rock band echoing the Beach Boys called Darlin’ who quickly fizzled out. Funny enough, the other band member, Laurent Brancowitz and his brother went on to create the famous group Phoenix. A negative review of Darlin’ once said that they were “daft punky thrash”, and I think you know where that led Homem-Christo and Bangalter (H-C and B) a year later. In 1997, after several years of successful singles, H-C and B released their debut album Homework with Virgin Records. In the coming decade and a half, Daft Punk released mostly successful albums like Discovery, Human After All, and Random Access Memories. 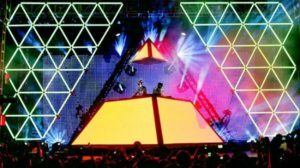 In 2007, after mixed feelings on Human After All and many thinking that Daft Punk’s stardom was finished, they appeared at Coachella and filled a 10,000 person tent with a massive 40,000 person crowd, changing the magnitude of modern live shows in the process. Since then, they have enjoyed enormous success. Their collaboration with Pharrell Williams “Get Lucky” was their first hit to top out at number one in the United Kingdom released in 2013. But their success is NOT the only thing that defines them. If you hadn’t noticed, they wear some crazy awesome headgear. There are very few good pictures of H-C’s and B’s actual faces on the interwebs, and they would like to keep it that way. It started out as not wanting to be photographed for magazines or publications. Then they made people blur their faces or substitute their images with animations. They finally settled on wearing masks (or black bags for early interviews). This all began during the years of their album Homework, and their gear has only improved. Now, their helmets include ventilation to keep them from overheating (Whaaa?). Daft Punk makes music for the masses, and they do it without having to be slaves to the music industry itself. 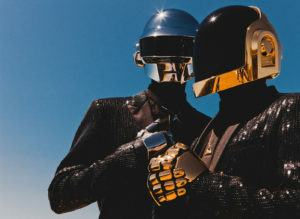 I think we can all learn a little something about humility from a couple of French guys wearing futuristic biker helmets playing with synthesizers.